"Many people find it hard to believe in a loving God. They doubt his existence altogether, or their experience of suffering and human tragedy make them doubt his love. Scientists seem to be solving the great puzzles of the universe, and psychologists seek to unlock the deepest mysteries of the human heart. But there are some questions that don't go away. What caused the whole universe to exist in the first place? What is the point of my own individual life? These are huge questions. You would be suspicious if someone claimed to answer them with any certainty. There is a limit, surely, to what we can discover for ourselves, and very often we need to admit that some questions are simply beyond human understanding." This is not a long volume, it comes in at under 50 pages in the print edition. But there is a lot of great information. This book would be excellent for a spouse who is not Catholic, for a teen looking to be able answer questions about their faith to friends and families. 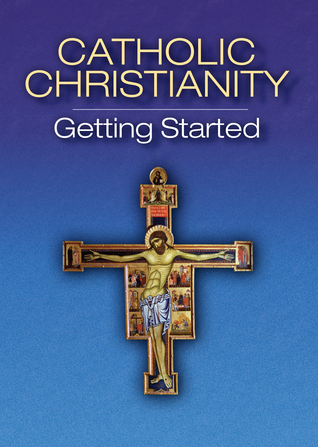 The chapter on How to Become a Catholic, is particularly good. And would be worth reading for someone returning to the church. "The journey doesn't end with Confirmation. As Catholics we should pray every day, take part in the Mass every Sunday and Holy Day of Obligation, live the seasons and feasts of the Church's life, receive the sacraments and live a life of Christian charity towards our fellow man. Christ invited us to deny ourselves, take up our cross and follow him. You are special and unique in the sight of God. He wants the best for you and is leading you to himself. As you reflect on how to become a Catholic, try to be open to God's will." Except for the last line I transpose it as 'As you reflect on your life as a Catholic, try to be open to God's will.' As such any Catholic Christian can read this book and benefit from it. This is a wonderful little read, and the teaching on different types of prayer and the small collection of prayers just add to the overall benefit of this book. Another great read from the Catholic Truth Society.